Pigeon Forge “Mt. Rushmore” – The Home of My "Big Things"
Also in Pigeon Forge is The Hollywood Wax Museum, currently under construction but looks to open soon. Despite the construction we were able to get this image. We guessed the profiles were John Wayne, Elvis, Marilyn Monroe and Charlie Chaplin. Do you agree? There appears to be more Big Things to come on this site. UPDATE: I later received the following e-mail from a finishing artist on this project, this is what he has to say. 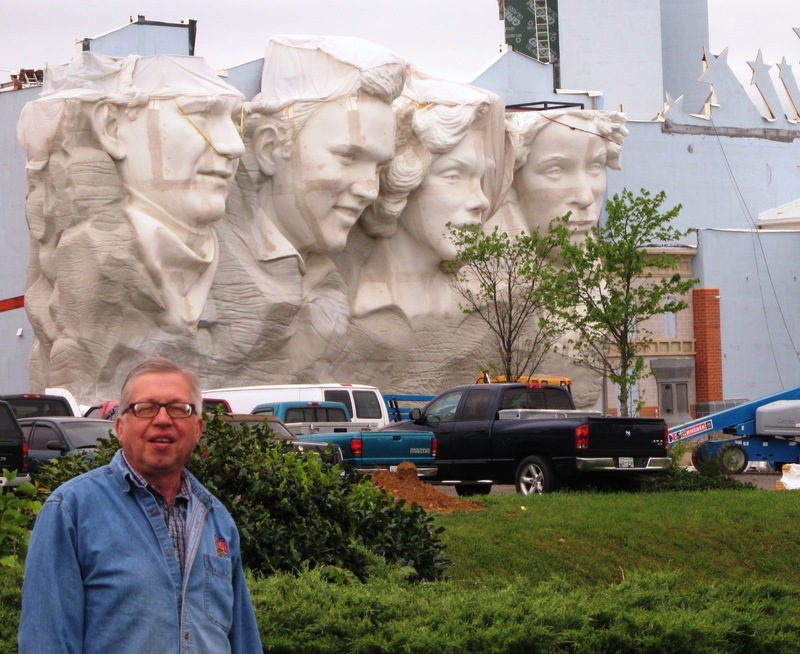 I helped as the finishing artist on this ‘Mt Rushmore’ at the Hollywood Wax Museum in Pigeon Forge. It’s unique as it was computer sculpted in Styrofoam and then hard coated with 2 unique hard coats. One is a wall spray ‘concrete’. The other is my own invention: Flex-a-Rock… A flexible cement-like sculpting paste. Flex-a-Rock is the only material that can make a faux brick or stone wall on canvas or Tyvek and be shipped rolled up like a poster. It will, I believe, change the way textures and decorative surfaces will be applied in theme parks, zoos and as faux finishes.